Stacie believes that the therapeutic relationship can be a great starting point for healing past and current hurts in one’s life. She views therapy as a tool to help an individual identify barriers and strengths that can assist in the healing process. Through open feedback and transparency in this type of relationship, she will work with each client to get a better understanding of their personal experience in order to craft a unique therapeutic environment in which they can work best. 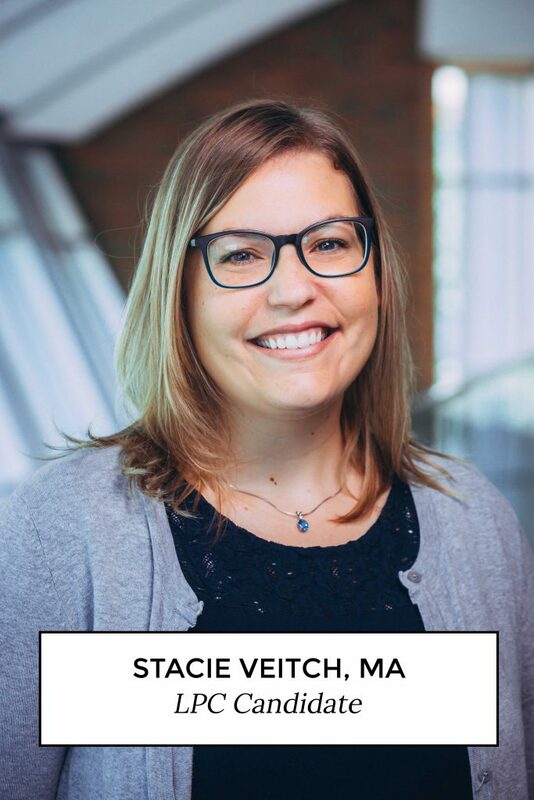 Stacie Veitch earned her Bachelors of Fine Arts from Oklahoma City University in 2010 and her Masters of Arts degree in Counseling Psychology from Southern Nazarene University in 2016. She completed 15 months of internship with Renew Counseling Center while completing her Masters and is currently an LPC candidate. She attends weekly individual and group supervision meetings, as well as continuing her education through research and attending seminars when possible. Stacie works with adolescents, adults, and couples. She has experience working with clients who have dealt with or are currently dealing with anxiety, depression, struggles with self-esteem and assertiveness, relational difficulties, grief and loss, difficult life experiences, and premarital/marital issues.